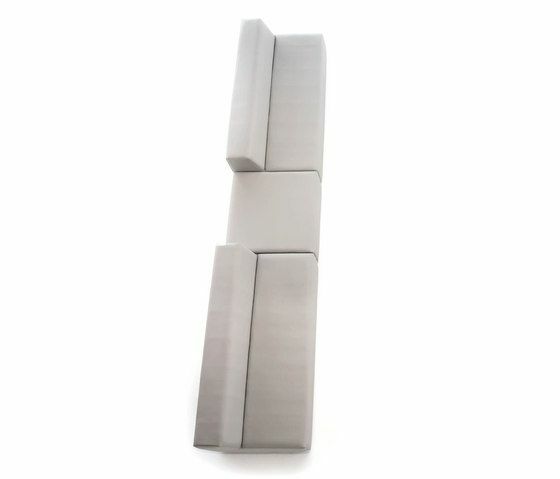 We try to design a timeless sofa with a simple geometry, which could be adapted to the contemporary architecture. It was necessary it was modulate in order to create different compositions with ergonomics well care for comfort. The measurements in height are with the wooden leg p-42. Sofa or module bigger than 200cm is ready to disassemble the arms in destiny. MATERIALS – Thick wood structure, HR 40kg/m3 foam cover. Suspension made with elastic Nea webbing, guarantee of quality 10 years. – Seat in HRD 40 - 35 kg/m3 foam, plus 3cm of extra soft supplement. – Back in HR 30kg/m3 foam. Cover of thermo-sealed H250gr fibre.